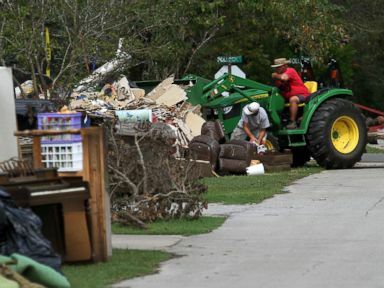 Businesses from Tesla to Pepsi to breweries both large and small have stepped in to offer help to victims of Hurricane Florence. Anheuser-Busch is sending more than 300,000 cans of drinking water in six truckloads to North Carolina, South Carolina, and Virginia from its brewery in Cartersville, Georgia, the company said in a press release. MillerCoors donated 80 pallets of water from its brewery in Virginia to American Red Cross shelters in the region, the company said. Smaller breweries are also joining in. Blue Blaze Brewing, which brews 5,000 barrels a year in Charlotte, North Carolina, filled its tanks with drinking water and sterilized its kegs for anyone, including from restaurants and other businesses, who may need to take a keg of fresh water. 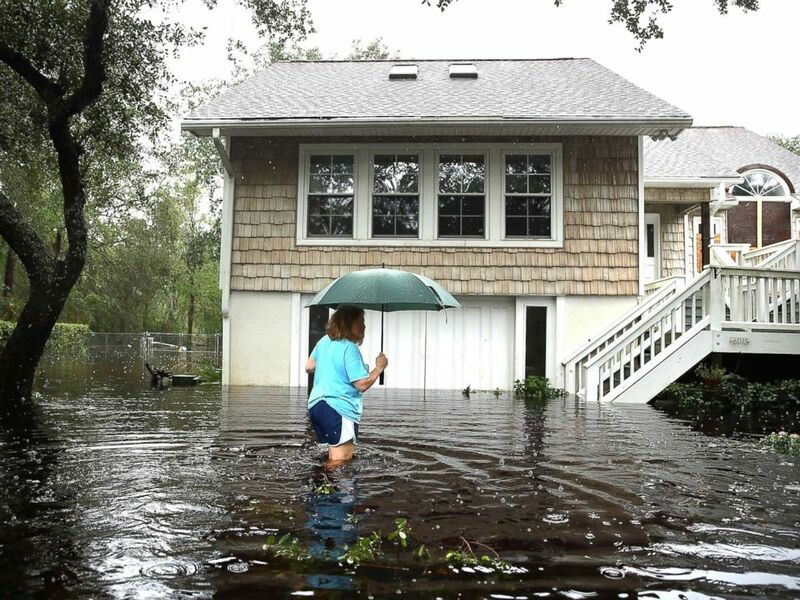 A woman makes her way to her home that is surrounded by flood waters after Hurricane Florence passed through the area on Sept. 15, 2018, in Southport, N.C.
Two other North Carolina breweries -- The Dreamchaser's Brewery and Resident Culture Brewing Co. –- are also pitching in. Chef José Andrés, who provided meals to Puerto Ricans after the devastation left by Hurricane Maria last year, is now in Wilmington, North Carolina, helping those in need. His team is delivering fresh food to evacuees, homeless shelters, emergency workers and local police. Pepsi is giving back to its birthplace -- New Bern, North Carolina -- which was overwhelmed by torrential flooding from Florence. The PepsiCo Foundation said it's donating $1 million to relief agencies and 350,000 meals to help those devastated by the storm. New Bern "is the birthplace of Pepsi," Pepsi CEO Indra Nooyi tweeted. "We wouldn’t be here without you and we are here for you now and always. #NewBernStrong"
Further up the coast in New Jersey, Ocean Resort Casino in Atlantic City opened its doors to let Hurricane Florence evacuees stay for free. Offline, the company has prepped 40 of its warehouses east of the Mississippi with Amazon-donated products that can be shipped as needed. The company, which recently hit a $1 trillion valuation, also donated 100,000 food items and more than 30,000 bottles of water to Feeding America, Amazon announced in a blog post. Tesla is helping its owners by expanding the battery capacity for affected customers until mid-October. The eligible Model S and Model X vehicles with 40kWh, 60kWh and 70kWh batteries will have their capacity expanded to 60kWh or 75kWh in the affected areas, according to a company spokesman. Tesla also opened up all of its express-charging stations in South Carolina, North Carolina, Virginia and Georgia to allow free charging of its cars.